Storks tend to use soaring, gliding flight, which conserves energy. Soaring requires thermal air currents. Ottomar Anschütz's famous 1884 album of photographs of storks inspired the design of Otto Lilienthal's experimental gliders of the late nineteenth century. Storks are heavy, with wide wingspans: the marabou stork, with a wingspan of 3.2 metres (10.5 feet) and weight up to 8 kg (18 lbs), joins the Andean condor in having the widest wingspan of all living land birds. The Modern English word can be traced back to Proto-Germanic *sturkaz. Nearly every Germanic language has a descendant of this proto-language word to indicate the (white) stork. Related names also occur in Latvian, "stārks", and some Slavic languages, e.g. "štorklja" in Slovenian and "щъркел" [shtŭrkel] in Bulgarian, originating as Germanic loanwords. In some West Germanic languages cognate words of a different etymology exist, e.g. 'ooievaar' in Dutch. They originate from *uda-faro, uda being related to water meaning something like swamp or moist area and faro being related to fare; so *uda-faro is something like he who walks in the swamp. In later times this name got reanalysed as *ōdaboro, ōda "fortune, wealth" + boro "bearer" meaning he who brings wealth adding to the myth of storks as maintainers of welfare and bringers of children. The centres of stork diversity are in tropical Asia and sub-Saharan Africa, with eight and six breeding species respectively. Just three species are present in the New World: wood stork, maguari stork and jabiru, which is the largest flying bird of the Americas. 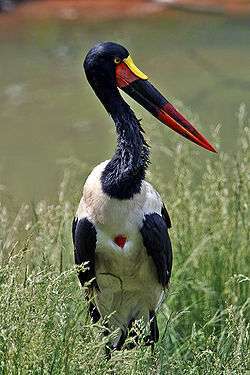 Two species, white and black stork, reach Europe and western temperate Asia, while one species, Oriental stork, reaches temperate areas of eastern Asia, and one species, black-necked stork, is found in Australasia. ↑ Specimens BMNH 39741 (holotype, left proximal tarsometatarsus) and BMNH 39734 (right distal tibiotarsus). Similar to Ephippiorhynchus and Leptotilos, may be from a small female of Leptotilos falconeri, from L. dubius, or from another species: Louchart, Antoine; Vignaud, Patrick; Likius, Andossa; Brunet, Michel & White, Tim D. (2005). "A large extinct marabou stork in African Pliocene hominid sites, and a review of the fossil species of Leptoptilos" (PDF). Acta Palaeontologica Polonica. 50 (3): 549–563. ↑ Distal radius of a mid-sized Ciconia or smallish Mycteria: Steadman, David W.; Arroyo-Cabrales, Joaquin; Johnson, Eileen & Guzman, A. Fabiola (1994). "New Information on the Late Pleistocene Birds from San Josecito Cave, Nuevo León, Mexico" (PDF). Condor. 96 (3): 577–589. doi:10.2307/1369460. "Stork". Encyclopædia Britannica (11th ed.). 1911. "Stork". Collier's New Encyclopedia. 1921.